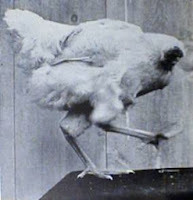 Mike the Headless Chicken is a story of a chicken who lived long back without its head. His owner has severed his head to kill it but missed the axe a little. The chicken lived between 1945-1947. Chicken after its head severed off lived for 18 months. The chicken was valued at $10,000 at that time. At the peak, the chicken earned $ 4500 per month. I've got so much work to do - I've been running around like a headless chicken all week. He was racing around like a chicken with its head cut off trying to do the work of two people.